Ulcer Factor™ is an ideal combination of compounds intended to provide relief of chronicGastric Ulcers in Horses/ Ulcer Factor gastritis and gastric ulcers in horses and foals thus promoting appetite and overall recovery. Ulcer Factor™ is a combination of natural ingredients intended to provide relief of chronic gastritis and gastric ulcers in horses and foals thus promoting appetite and overall recovery. It is a formula based on micro-dosage levels of natural ingredients which guarantee its safety and non-toxicity. 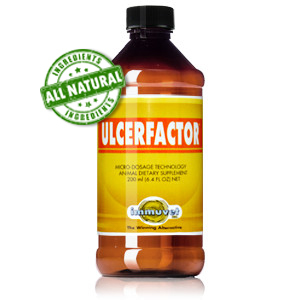 Ulcer Factor™ is recommended for horses in training and/or competing as well as neonatal foals. Testing results have provided the veterinarian, breeder and trainer with a new breakthrough tool to quickly help control these frequently common and tough pathologies. In the process of normalizing HCl production. Regenerate the stomach mucosa epithelium. Relieve symptoms associated with ulcers. Give your horse 10ml of Ulcer Factor™ under the tongue on an empty stomach first thing in the morning for 30 to 60 days. Shake bottle vigorously 10 times before drawing 10ml dose (every time you use it). We strongly recommend administering the dose under the tongue to allow for maximum absorption. Do not mix different products in the same syringe.